Hello from our bright and shiny new website! We hope you take a few minutes to take a look around and visit our new online home. We’ve just launched our summer Fathify campaign, here. This time, our primary focus is raising money to develop a Religious Exploration program for Unitarian Universalist Congregations. Additionally, we are using a portion of the funds to enhance the ways we communicate with our supporters, for things like website enhancements, newsletters and a new introductory video. So many times when I visit a congregation, I’m asked if I have any stories or supplemental materials to share that support the vision and mission of developing sustainable and effective community-based, hunger-relief programs. With these funds from this latest campaign, I’ll be able to say yes! 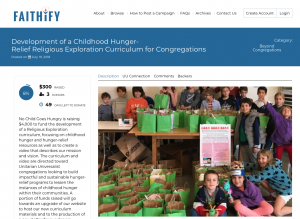 Introduction of No Child Goes Hungry to the Congregational RE Community: Information will be provided about childhood hunger in the United States, the work and mission of NCGH and how congregations can build and promote hunger relief activities within their communities. Family “No Child Goes Hungry” Workshop Day: NCGH will develop various activities to support a workshop day where families come together to learn about local childhood hunger issues and how to alleviate hunger. At the conclusion of the workshop, the congregation will have an action list from which to move forward with a sustainable hunger-relief plan. We are so excited about this, but we need your help! Please visit our Faithify Campaign to learn more and to make a donation. If you would like to make a donation to this campaign outside of the website, please contact me directly at kmrasmussen@nochildgoeshungry.net and I’ll be happy to help you do that.